Do I need a new excuse to travel? No, but it is nice to have a focus for a sojourn. In February 2016 when I was staying with Alex, Davide (yes with an E) had just arrived days before from Milan to work for Mari. He was staying at their house. Since then I have enjoyed seeing him when he stops by at David and Mari’s. When I last saw him, he told me his girl friend was coming for another visit. “There is more to the US than Boston and New York,” I told him, “make sure you come visit me to see the countryside.” And the plan was laid, with Gary bringing them out. 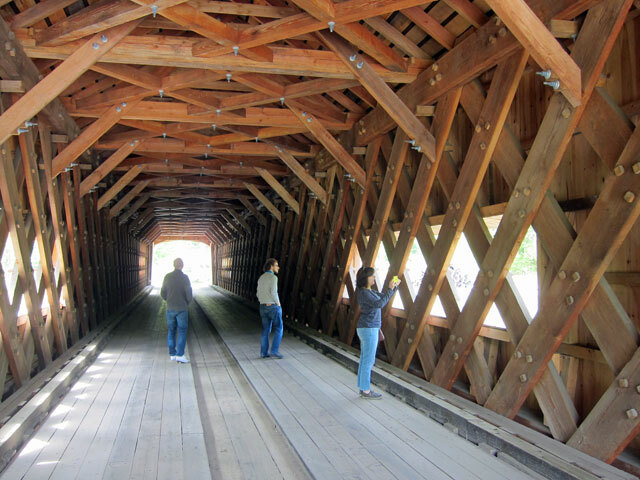 As plans developed, Davide said, “I have never seen a covered bridge.” Say no more, I began planning. The visit was delayed one weekend due to inclement weather, but they arrived the afternoon of Saturday 20 May (see how hard it is becoming for me to find time to write a post? Too much to do). 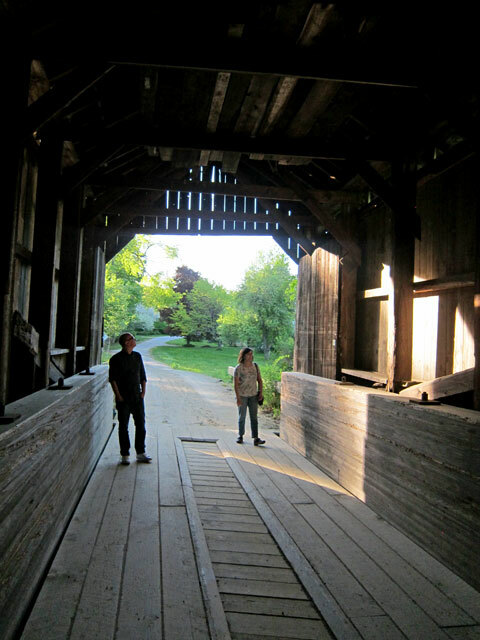 The plan for their arrival day – drive to Grafton, VT for dinner, and three covered bridges on that 17 mile trip. Originally built in 1867, a dump truck crashed through it in 1980. 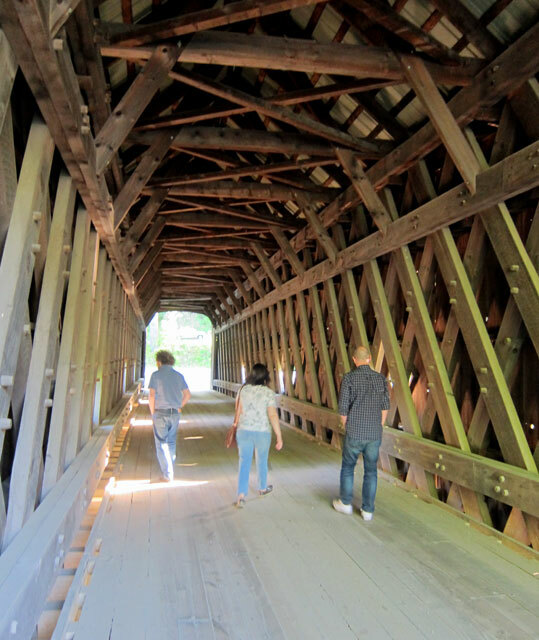 The bridge here now was built to the same specs and opened in 1982 by covered bridge builder Milton S. Graton. Yes, I have his book THE LAST OF THE COVERED BRIDGE BUILDERS, and laid inside I have articles about Graton, his business card, and the dedication ceremony program for the “new” bridge. 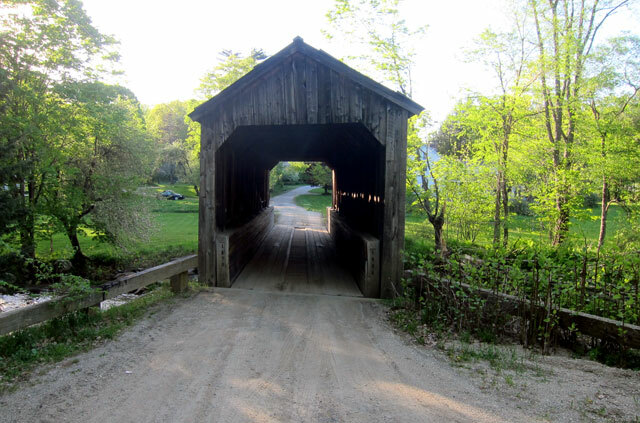 Erected off-site, reassembled in the field to the north of the river, a team of oxen then pulled the bridge across the river and into place. Wish I had been there. This will give you an idea of size – at 120 feet it is the longest covered bridge in Vermont. 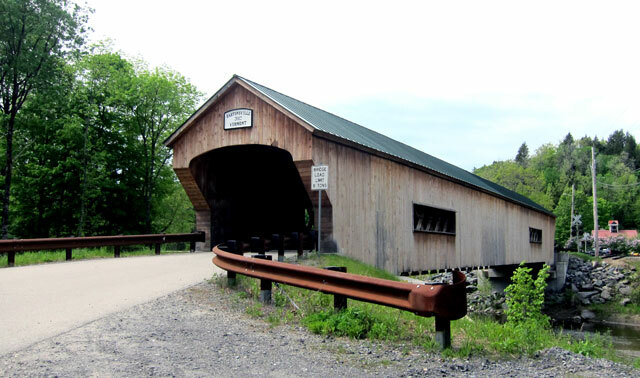 Vermont has more covered bridges than the rest of New England combined. 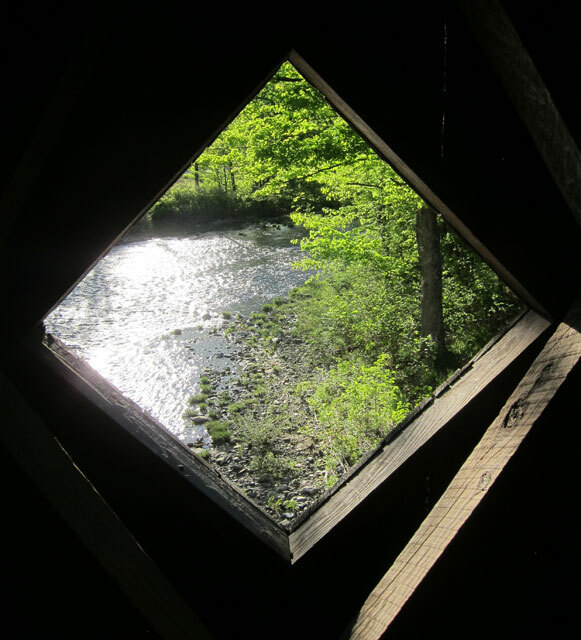 You know I like to “look through windows” framing a view. and, who can resist a country stream (river) scene? Where is your picnic basket? There were a few interesting notices posted inside the bridge. 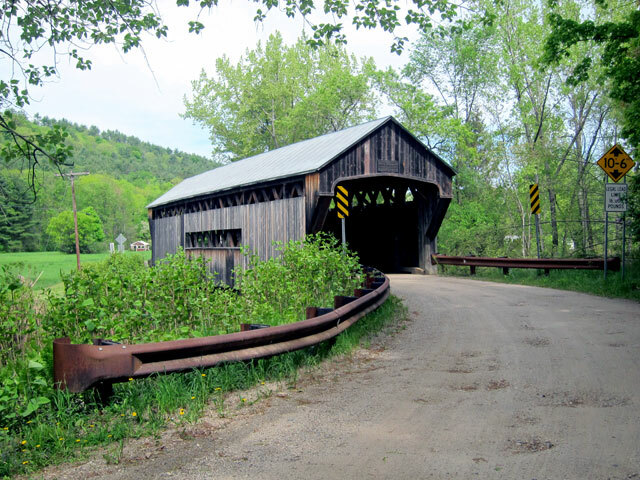 Reference to a Vermont Covered Bridge website, and a weathered flyer for a Covered Bridge Post Card Collectors Association – right up my “alley” of interests. 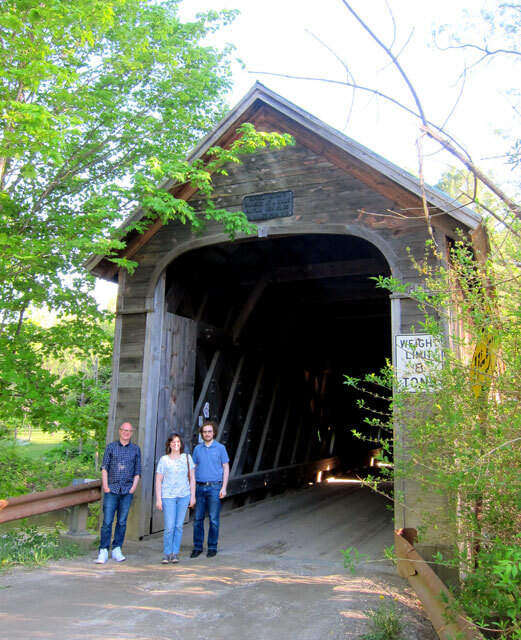 When we got home Saturday night we discovered the postcard group no longer existed, but the other website lead to information about the book SPANNING TIME: VERMONT’S COVERED BRIDGES by Joseph C. Nelson. I checked my office computer, and last sold a copy in December 2009 for $60. Quick check on-line and I bought a copy for $12.45 (prime example of what has happened to book prices adversely affecting my business). My “new” copy is now to my right on the counter, and answered some questions we had – and it will serve as a future tour source. Also I have brought downstairs two classic unread 1950s covered bridge books that I have had in my library for over 25 years — now being read. … But back to the weekend and images. We travel through Saxton’s River on towards Grafton, and crossing into the preserved village I knew where to turn for Kidder Hill Bridge. Sixty-eight feet long, notice how it is built at an angle and with a multiple roadway decking. We were intrigued by the massive wood along the sides, assuming they were there to protect the sides. But, one answer from a book makes the purchase worthwhile. SPANNING TIME tells me that when this 1870 bridge was reconstructed in 1994-95 that the one foot by five foot laminated wood beam on each side were developed to support the bridge from abutment to abutment. Buy the book before you tour. The bridge leads to a now closed soapstone quarry. If you ever find the Grafton Historical Society open (I did once) do stop in and learn all about the soapstone industry. I thought I documented that visit here, but cannot find it – guess I need to go again – and also find the booklet I bought. It was then out another side road to the site of the Old Grafton Village Cheese Factory and MacMillan Bridge. A reproduction, built in 1967, it is a footpath to the fields behind. You know I like images of texture and through openings. Think covered bridges will serve me well with both. The plan was to eat dinner at Phelps Barn and Tavern at the Grafton Inn. As we were entering Elisa noticed the sign – CLOSED FOR PRIVATE EVENT. Think fast, Ray. And, we headed back to the Saxton’s River Inn for a nice dinner. 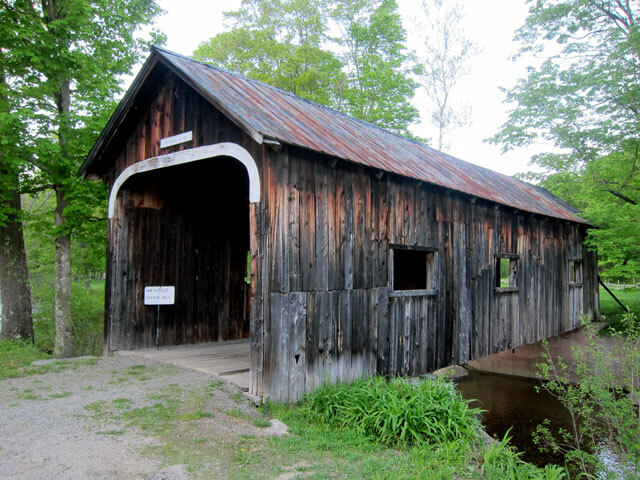 The plan for Sunday, 21 May, seven more covered bridges. We made it to two. Remember, have a plan, but if you do not make it all the way through, that is because you are having fun and doing more along the way. First stop off Route 102 on the way to Chester – Worrall Bridge crossing Williams River. 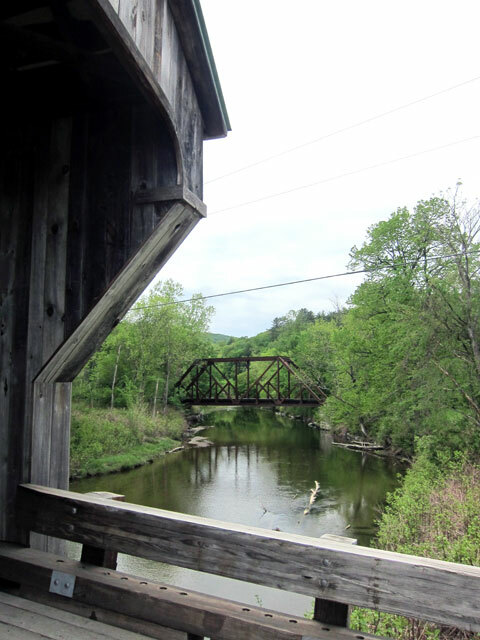 Built in 1868, another bucolic spot, with comparisons looking to the old railroad bridge. In the gallery below (remember you can click my galleries to see larger images) you will see one of the old signs posted inside. Reading last night, I learned that the inside of bridges were plastered with ads, circus announcements, patent medicines, and the like. Below is the “new” bridge – nostalgically replacing the lost treasure. It was then Chester and a drive around another village green before heading over Andover into Weston. 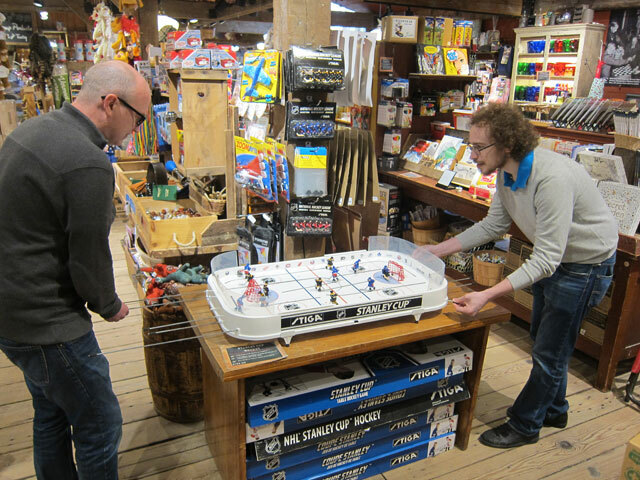 I figured they had to see an old country store and wares from years gone by. 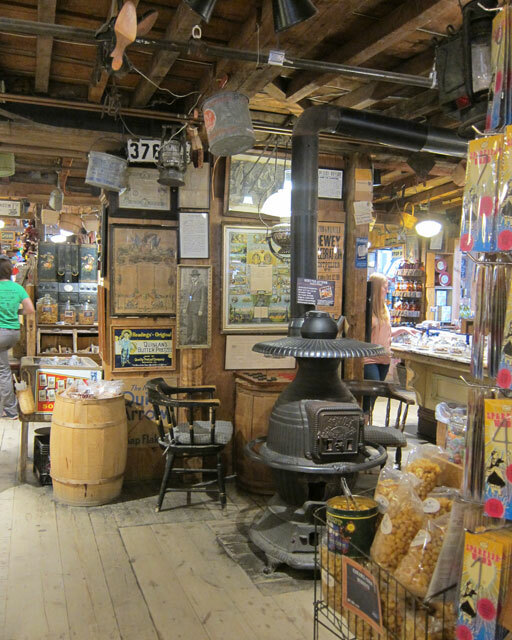 You know my love of old country stores (as shared here) and my history in Weston from my visit with the founder of the store in 1946 – Vrest Orton – while I was camping in the area in my 1929 Model A Ford Roadster in 1963. You have heard that before, and will hear it again. It was at this potbelly stove that I chatted with Mr. Orton who ironically had known my great-grandfather – Franz Boas. Well, I was wrong about the short visit. 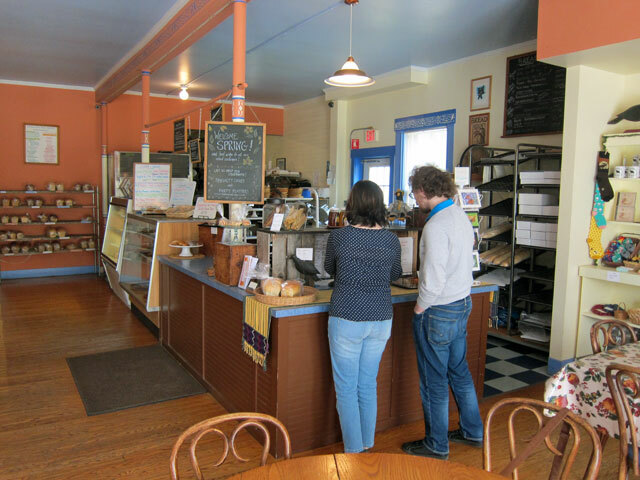 The Vermont Country Store was a hit with Davide and Elisa. Almost a two hour visit with the first 20 minutes the boys “playing.” Elisa was very sad that she had limited space in her bags and could not take everything home. Gary and Davide adequately absorbed. 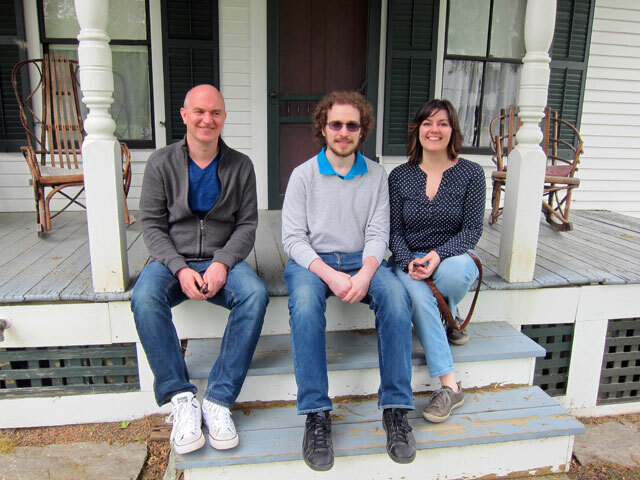 And, where would you expect me to take them to experience a rural 19th century Vermont “hill town?” No second guess needed – my favorite Plymouth Notch. 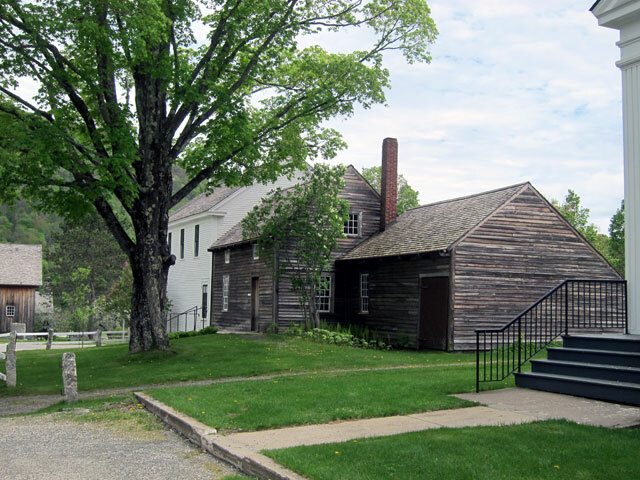 President Coolidge’s site not open until Memorial Day – but you know I love to visit and share. Rocking chairs on the President’s front porch, to be added to my Rocking Chair Studies page. Although not yet opened, I just felt we would see the site’s director, Bill Jenney, and we did. 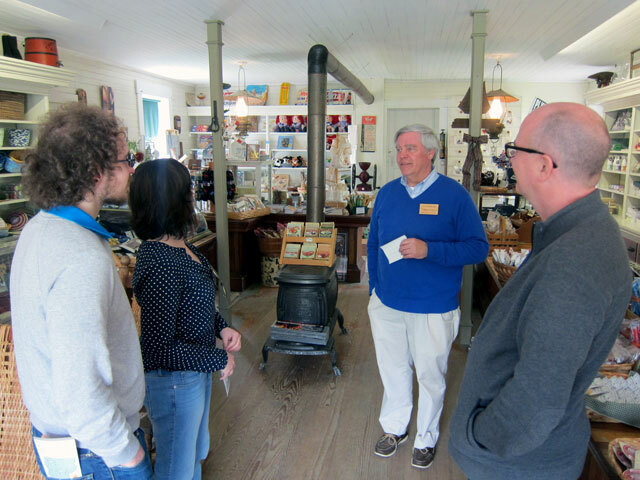 He was unpacking things inside the country store, and invited us in sharing some Presidential stories. We walked up to the cheese factory which was open, enjoyed seeing the goodies, and particularly the museum. I don’t recall studying the plaques on making cheese (and there are many more groupings of history etc.) so decided to share them here with you. Click on the first to open up larger readable sizes. 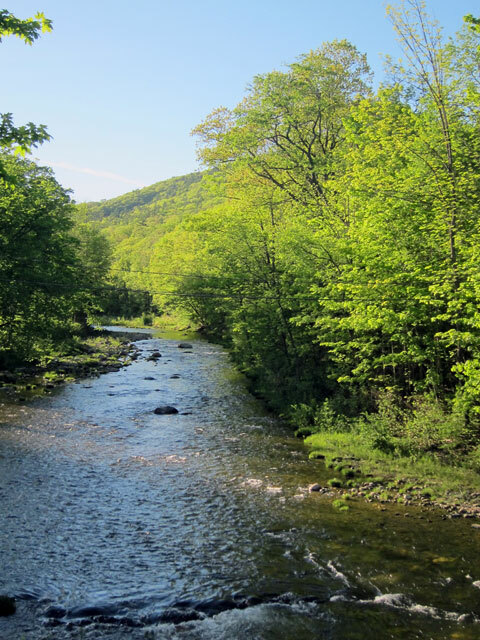 And, I know you have seen many of my images of Plymouth Notch, but you should realize that everyday a view changes, so here are some more walking back from the cheese factory. 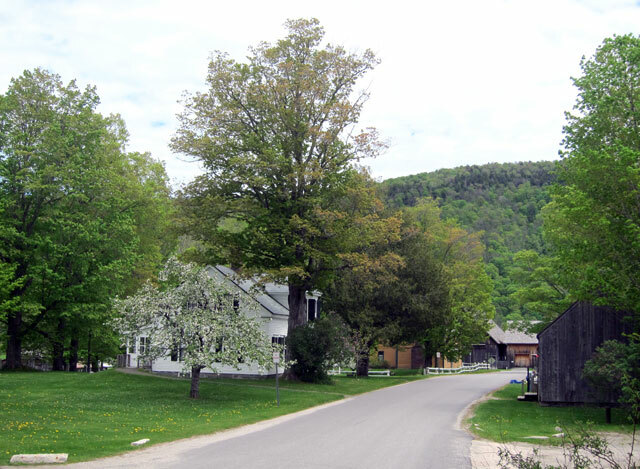 I realized that Plymouth Notch could be the most photographed village in Vermont, and I am probably the one who has taken the most photographs. When we were heading back to the car, Bill came out of the store and said, “would you like me to open up the upstairs so you can show your friends the Summer White House?” No need to ask twice. What a treat, and here is the 1924 Summer White House as it would have appeared at that date. And, you know I like “views out windows” so here are two from the White House windows. 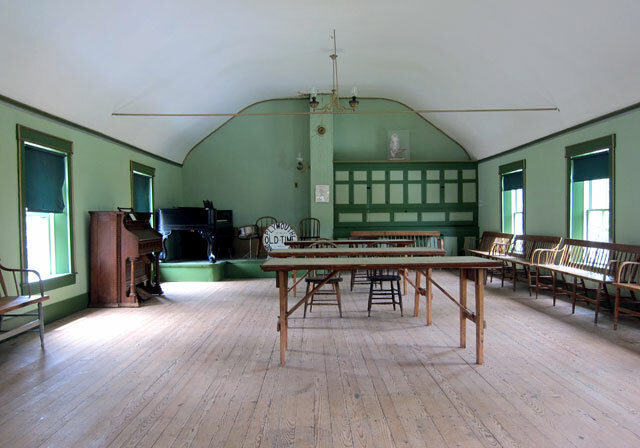 The old Tea Room, gift shop and cabins from the 1920s. We were there alone with the staff of one who introduced herself as “Crazy Melody.” We all had fun, but I wonder what Davide and Elisa will share about that experience back in Italy. 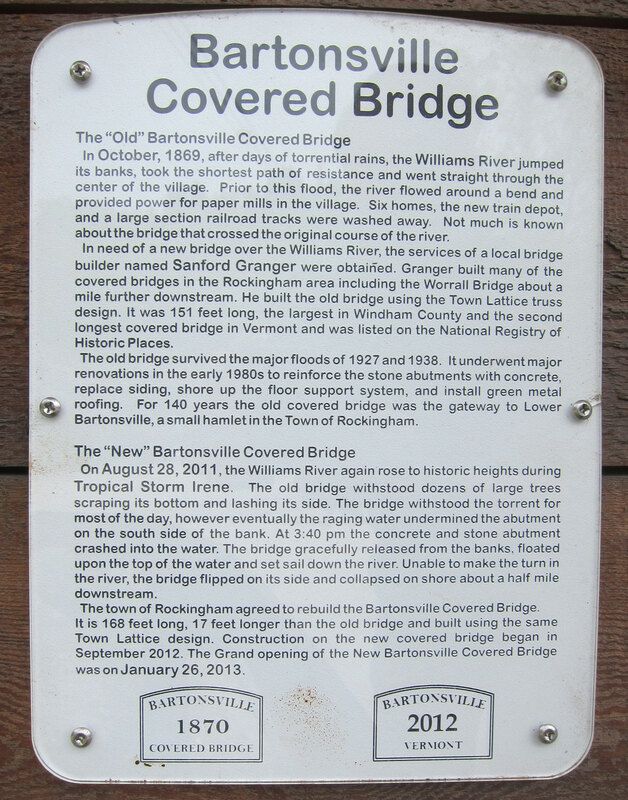 This entry was posted in Day (or maybe two) Trips, Plymouth Notch, Vermont and tagged Bartonsville Covered Bridge, Covered Bridge, Crows Bakery, Plymouth Notch, Proctorsville, Vermont, Vermont Country Store, Weston. Bookmark the permalink. You know, Ray, if you ever have free time (cough, cough) you should take up photography. I just love looking at your photographs! That was a great trip Ray. Love the photos of the old bridges. A couple need some paint?